Landscape is the fallback motif for curators and critics striving to bind together a disparate, difficult assortment of Indigenous and post-colonial works under the banner of 'Australian art'. It dominates the representation of Australia to an international audience in not only the visual arts, but also literature, film, and the tourism industry. The Royal Academy has also chosen this well-traversed route for its 200-strong exhibition of (mostly) paintings from the Great Southern Land. A theme that is timeworn to Australians may still seem fresh to the locals, however: as the first major survey of Australian art in the UK for fifty years, Australia cannot rely on much public familiarity with the works on display. Inevitably, the curation deviates little from the school textbook version of Australian art history, and is unashamedly geared towards a bemused British audience. In the second room of the exhibition, the interconnecting nodes of Uta Uta Tjangala's Old Man Dreaming, 1983, are likened to the London Underground map, in that the relative positioning of elements is more significant than geographical scale. Such analogies are jarring, and don't exactly encourage viewers to deviate from Western perspectives in their reading of Indigenous works. 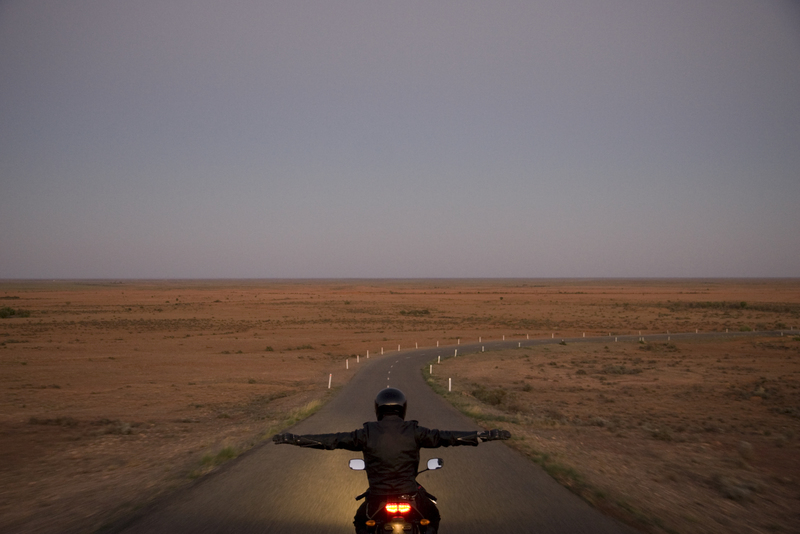 Sidney Nolan's Ned Kelly is Australia's literal poster-boy; as the first work of the exhibition, Shaun Gladwell's Approach to Mundi Mundi, 2007—featuring the artist as a Mad Max-inspired biker, leather clad, black-helmeted, riding towards the horizon with arms outstretched like wings—is set up as a striking yet didactic contemporary parallel. Visually and conceptually, these works bookend the show with visions of a lone ranger: at once questing mortal, vengeful god, and sacrificial offering to the open plains. Nolan and Gladwell also set up many of the secondary themes of the exhibition: emptiness, ritual, sacrifice, masculinity, frontiers and pioneers, unity with nature, ambiguity, narrative, a seeming suspension of quantifiable time, and a certain troubling ‘primitivist mystique’ that dogs the exhibition without being critically addressed. 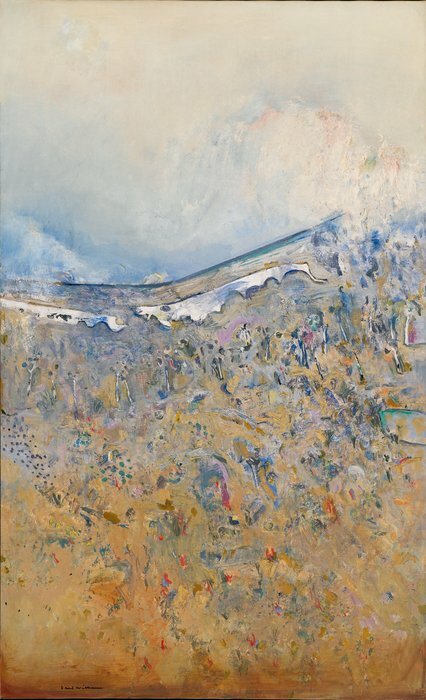 Fred Williams, Snow Storm, Kosciusko, 1976–77, Oil on canvas, 101.6 × 183 cm, National Gallery of Australia, Canberra. Purchased with funds from the Ruth Komon Bequest, 2013 © DACS 2013. The early stages of the exhibition present a coherent overview of early white perspectives of their strange new surroundings. Colonial landscape painting predominantly aimed to exert white ownership and control of the land and its native inhabitants, promote mythologies of the pioneer spirit, capture the curious qualities and features of the continent, or a combination of the above. From one room to the next, the landscape drastically transforms from European-tinted sleepy hamlets and dramatic alpine crags, to the colours and forms representative of native Australian flora. This metamorphosis strikes to the very heart of what 'landscape' is: a cultural construct; a natural state shaped to fit the ideals of its people. The Impressionist era is also well represented, including several major works by Frederick McCubbin (Lost, 1886; The Pioneer, 1904), Arthur Streeton (Golden Summer, Eaglemont, 1889; Fire's On, 1891) and Tom Roberts (A Break Away!, 1891). Nationalism manifests in the lone figures battling heroically against and/or uniting with the landscape, and the pastoral colour palette of gold, blue, white and green-grey, all dominated by the bleaching haze of that over-zealous, penetrating white light particular to the continent, about which so much has been written. The Modernist period is also approached with dedication, and there are some refreshing counterpoints that stand out from the exhibition's generally orthodox narrative, such as the placing of Max Dupain's iconic 1937 Sunbaker (the bronzed shoulders that launched a thousand postcards) next to Passing Trams, 1931, and Morning Shadows, 1932, two wonderfully nebulous Tonalist paintings by Dupain’s neglected female contemporary, Clarice Beckett. Urban environments appear more frequently but the emphasis is still on deserted and arid spaces, whether made of concrete or red sandy clay. Emily Kame Kngwarreye, Anwerlarr Anganenty (Big Yam Dreaming), 1995, Synthetic polymer paint on canvas, 291.1 x 801.8 cm, National Gallery of Victoria, Melbourne. Presented through the Art Foundation of Victoria by Donald and Janet Holt and family, Governors, 1995 © DACS 2013. Compelling works by Indigenous artists including Emily Kane Kngwarreye's Anweriarr Anganenty (Big Yam Dreaming), 1995, Rover Thomas' Cyclone Tracy, 1991, and Roads Meeting, 1987, and Clifford Possum Tjapaltjarri's Warlugulong, 1977, are sectioned into rooms outside of the chronology that dictates the rest of the exhibition. This is perhaps an effort to position these works outside of Western concepts of time and linear progress, and to situate Indigenous output parallel to white artistic developments; however the configuration also works to obscure the problematic recent history of contemporary Indigenous art production and its relationship with the global art market. Documentation of the large body of site-specific art that continues to play a key role in Indigenous culture, including rock and sand art, is also omitted in favour of portable Papunya Tula canvases and Arnhem Land bark paintings. Though this is an exhibition full of big skies and wide-open spaces, very little breathing room has been allocated to art post-1970. There are three powerful semi-abstractions by Fred Williams, but they feel crowded by Brett Whiteley's immense Big Orange (Sunset), 1974, and a poorly lit, ceiling-hung John Olsen. Rosalie Gascoigne, Monaro, 1989, Synthetic polymer paint on soft-drink crates on plywood, 131 x 457 cm, State Art Collection, Art Gallery of Western Australia, Perth. Purchased 1989; Photo Bo Wong, Art Gallery of Western Australia © DACS 2013. Inevitably, recent generations of artists have approached the landscape in more varied ways, for more varied reasons; this is true of contemporary art and its subjects everywhere. Coincidentally, the contemporary art section of Australia is also the point at which the exhibition suddenly expands beyond painting, adding to the sense of overload. The impact of individuals' contributions to this increasingly complicated theme—including works by Rosalie Gascoigne, Bill Henson and Rosemary Laing—is lost within rooms that try to cover too much ground, too quickly. Even Howard Arkley's giant, fluorescent suburban-dream-gone-mad, Superb + Solid, 1998, manages to feel sidelined, and surely Up In The Sky, 1997, Tracey Moffatt’s photolithographic series evoking the experiences of the Stolen Generation through haunting, uneasy Pasolini-eque tableaux, deserves more than an abridged mention. There's something vaguely unsettling about a once-mighty colonial power filling gallery after gallery with visions of its captured lands, without engaging in any sustained dialogue about the controversial and traumatic history that has shaped this body of work. But this is a sensitive issue, and would be a big ask for a mainstream British institution such as the Royal Academy to take on. Ultimately, for all its flaws Australia provides an excellent opportunity to see a large number of works that may not pass this way again for another half-century (though hopefully sooner), and to fathom both to what extent Australians themselves continue to buy into the mythologies that have emerged from a unique and complex relationship with the land, and how artists fuel or distort these visions.